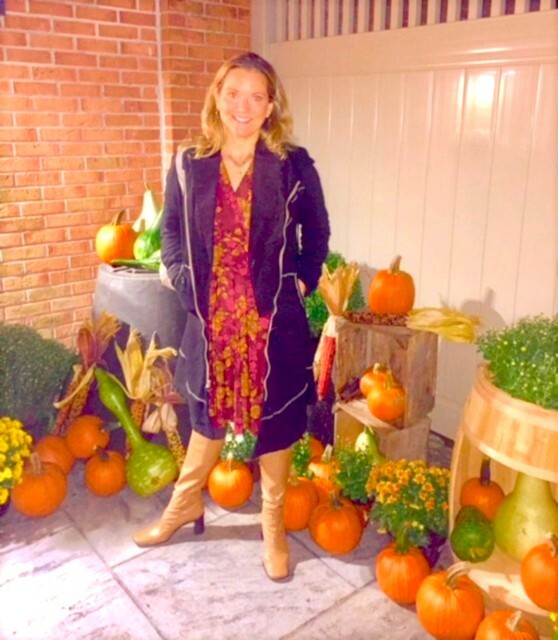 It may not feel like Fall yet, given the current heat and humidity in NYC, but at a visit to the Kripalu Yoga Center in the Berkshires, they had a festive Fall pumpkin display that reminded me how wonderful this season truly is. The leaves were just starting to turn to their bright orange, yellow and red hues. The evening mountain air felt crisp, cool and clean while the days were warm enough to enjoy a morning walk and afternoon latte outside in the sun. Although NYC is usually a few weeks or so behind the Berkshires in terms of seasonal shifts, soon our city trees will also be creating a kaleidoscope of colors for our viewing pleasure. Let’s allow the metamorphosis of the deciduous trees to inspire us as well; shedding what we no longer need in our lives and preparing for new growth and personal expansion. Tree pose in yoga is one of the most grounding asanas; not only does it help us work on our balance, but it also helps us focus and still the mind as one cannot easily balance on one leg if the mind is scattered and not connected to what the body is doing in that moment. Whether one is balancing on the yoga mat, or holding on to a chair or wall, envision the soles of your feet as if they were the roots of the tree reaching down towards the center of the Earth, your legs and torso as the strong, steady tree trunk, and your arms as the tree branches connecting to the sky above or laterally towards other trees in the forest. One nice, and challenging option, is to wave your arms and torso slightly from side to side emulating a tree swaying in the gentle breeze and further challenging our balance in the pose. Perhaps next time you practice tree pose (vrikshasana), embody a beautiful Fall tree with its’ vibrant colors inspiring awe to those who view it. Have fun with your experiment, and remember no judgments (employing the yogic concept of ahimsa in all our poses) – even if you come out of the pose sooner than you had planned! Yoga is all about practice and process, being in the moment and letting go of goals. See below for this month’s class schedule. Please note that I will be on vacation until mid-October, but hope to see you before or after my trip! I will be attending the Integral Yoga Fall Fundraiser,and perhaps you will be there as well? See below for the information on what will no doubt be a special evening supporting this historic NYC yoga center and ashram. 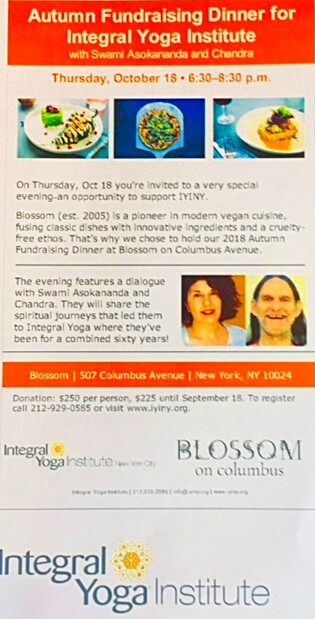 IYI directors, Chandra and Swami Asokananda, are truly lovely people and dedicated yogis; you will have an opportunity to converse with them and your fellow students outside of yoga class, enjoy a delicious meal, and help support this yoga non-profit organization.